practicing meditation is very beneficial to our health and mind. But how do we meditate? 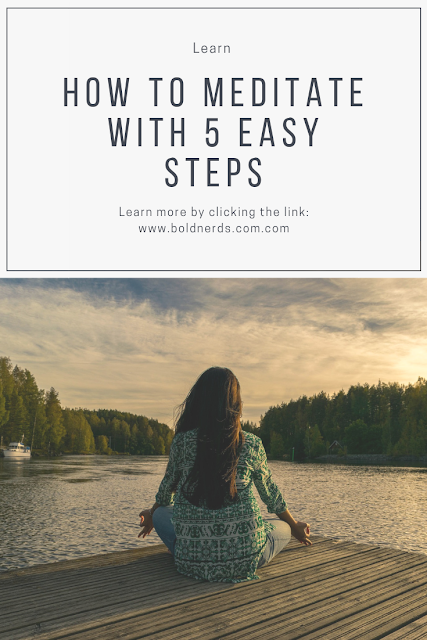 Here's how to meditate in 5 easy steps. In our previous article, we discussed the importance of meditation and we noticed we were missing a lot by not practicing proper meditation. Both spiritual benefits like connecting to our maker and some physical benefits which are reducing blood pressure, stress, treating HIV etc. and even emotional benefits like taking away worries among others. Today, we won’t talk much about the benefits but instead look at how it is done. I had wanted to add that to the benefits. However, I realized we were going to have quite a lengthy article and probably some of us might get bored reading it. So, I kept it as short as possible. 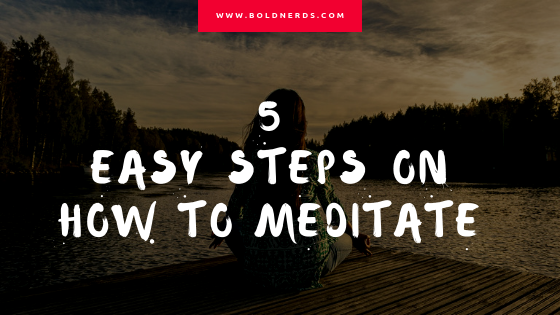 Before we dive into how to properly meditate, let it be known that there are levels in meditating and this article is focusing more on a beginner’s perspective. It isn’t advisable to drink coffee before meditating. Always meditate in a cool dim room where there isn’t much brightness. Try not to be disturbed when meditating. Have your meditation when there’s no one around or at particular times when you know you won’t be bothered. Always sit comfortably, either with legs crossed out or straight. You can lie down if that feels more comfortable. Sit comfortably and try to focus on a particular thing. It can be an object, a thought or even your breathing. Stay relaxed and calm. Note that there are many positions one may consider if comfortability is an issue. You can sit on a mat with your hands on your laps but faced upwards like someone receiving a gift or you might just love to sit on the chair with your hands at the same position but this time your palm should be facing your laps. In both sitting positions, always try to keep your back straight for proper relaxation. A mantra is a word or phrase that you recite within you without having to voice it out. A commonly used word is PEACE meanwhile others may use love or any other word that is easier to recite. Stay calm. Keep the body and mind more relaxed by inhaling and exhaling slowly but deeply. When you breathe in, wait for a few seconds to pass then, exhale. Repeat this a few times and move to the next step. This isn’t for everyone. There are people that may be likely to fall asleep if their eyes are closed for a couple of minutes. Although closing the eye can help you stay more focused, you can keep them open if that works best for you. Instead, keep your eye on an object to help you stay focused and not wander your mind around. When you’re more focused, you can try to close your eyes slowly and imagine the object in front of you. You may prefer not to recite the word(s) but instead, imagine that someone is saying them to you. This makes you more relaxed since you’re not doing the job. Do this for 30minutes. I know this sounds like a big deal for someone who’s a starter. Actually, this is just okay if you want to benefit from meditation. However, for starters, you can spend 10minutes or more practicing this and grow to 30 minutes when the process becomes effortless. Meditation is best practiced daily. If you want to benefit from meditation, focus on spending quality time on daily practice and try as much as possible to repeat the practice same time next time. This helps to establish a firm connection with your mind and body helping you relax effortlessly. Personally, morning meditation is best. I don’t know what most meditation trainers and yoga professionals recommend. However, you’d want to be full of energy, stay calmer and positive when you step out of your house each morning. Others love to meditate twice a day. That’s also okay. In fact, its recommended. Evening meditation helps to reduce stress and restore calmness after a heavy day’s schedule. For starters, you’re not alone. I’m also just starting out so you have someone riding on the same boat as you. Just give it a try and when you see the benefits, no one will ask you to keep practicing. The reward for meditation is calmness and many other benefits. You should know different techniques might work for different persons. If you’re finding it difficult to stay relaxed and focused, you might want to try other meditation techniques or sitting positions for comfortability. We have come to the end of another blog topic. I hope you find this article on how to meditate in 5 easy steps useful. Tell a friend about it and help them live a happier life.